Gender inequity is both a cause and consequence of violence against women. Australian and international research concludes that to prevent violence against women before it occurs we must take action to increase gender equity and challenge rigidly defined gender roles and identities. Are you looking for resources on this topic? Have a look at our Preventing Violence Against Women Resources page. WHIN provides leadership and resourcing for strategic regional partnerships to prevent violence against women. This includes leading the implementation and evaluation of the Building a Respectful Community Strategy 2017–2021 (discussed below) and convening and resourcing the NMR Preventing Violence Against Women Committee. 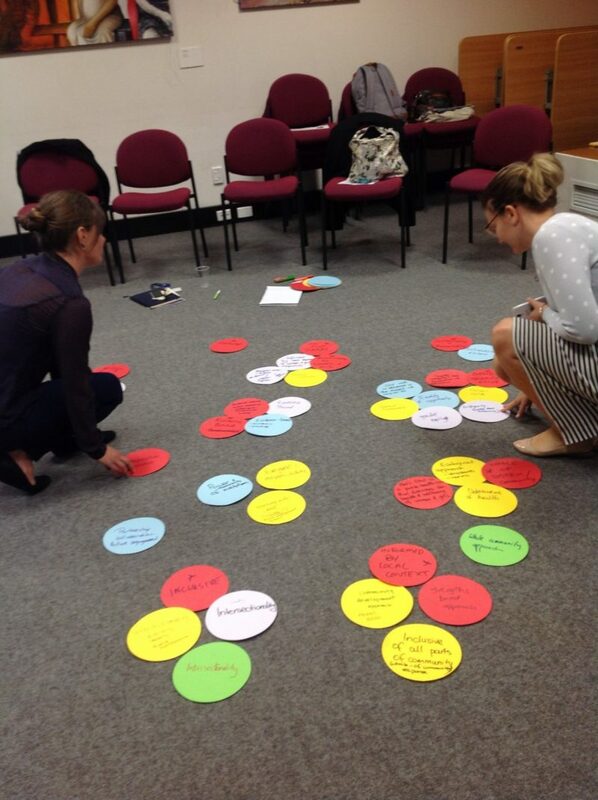 WHIN also develops and delivers training to partners to build capacity in applying a whole-of-organisation approach to primary prevention of violence against women, including bringing a gendered approach to the link between gambling and family violence. Bringing together the latest evidence and drawing on extensive expertise across the region, Building a Respectful Community Strategy 2017–2021 is the new strategy for the primary prevention of violence against women for the northern metropolitan region of Melbourne. The Strategy was launched online in June 2017. It aims to guide and inspire organisations across Melbourne’s north to prevent violence against women and promote gender equity across workplaces, community groups and neighbourhoods, communications, services and facilities. The Strategy was developed by the Building a Respectful Community Partnership. Partner organisations have committed to taking action under all five goal areas of the Strategy over the next four years. Building a Respectful Community Strategy 2017– 2021 continues the collaborative approach that was established in Building a Respectful Community – Preventing Violence against Women – A Strategy for the Northern Metropolitan Region of Melbourne 2011–2016. Our website has a special set of pages dedicated to the Building a Respectful Community Partnership and Strategy. Development of the new regional prevention strategy prompted the formalisation of the Building a Respectful Community Partnership, an alliance of 25 organisations committed to working together to prevent violence against women, led by WHIN. This includes seven local governments, 13 health services and organisations, three community service organisations and a tertiary institution. Representatives from partner organisations attend the Northern Metropolitan Region Preventing Violence Against Women Committee (NMR PVAW Committee) and contribute to shared action plans, evaluation and seek opportunities for other shared work. The 16 Days of Activism against Gender-Based Violence is a global campaign dedicated to ending gender-based violence and raising awareness about the impact of violence against women. The campaign runs from 25 November, which is the International Day for the Elimination of Violence against Women, to 10 December, International Human Rights Day. These days were chosen in order to symbolically link violence against women and human rights and to emphasise that violence against women is a violation of human rights. WHIN engages in the 16 Days campaign each year, encouraging community members and partner organisations to also take part. WHIN has created a 16 Days Campaign Tool Kit to assist individuals and organisations to get involved. In 2018, WHIN will be running a social media campaign, ’16 Actions for 16 Days’, with photos featuring health and community service stakeholders and WHIN staff holding signs promoting actions such as: ‘Don’t fund sexism: Don’t buy media or products that portray women in a degrading or violent manner’. These actions challenge the four gendered drivers of violence against women as outlined in Change the Story: A shared framework for the prevention of violence against women and their children in Australia. To participate in ’16 Actions for 16 Days’, please contact WHIN for a copy of the actions. ‘Side by Side’ is a respectful relationships and sexual and reproductive health program for communities affected by female genital cutting (FGC). See the ‘Side by Side’ project page for more information. WHIN provides advice and expertise to steering or advisory groups for the ‘Good People Act Now’ project (a youth-focused project run by Banksia Gardens Community Services), the ‘Hume CREW’ (‘Community for Respect and Equality of Women’ project run by Dianella Community Health), ‘Moreland Active Fathers’ (a Moreland Council and Kildonan project to promote father-inclusive practice) and ‘INCEPT’, the ‘Inner North West Collaborative Evaluation Project’.